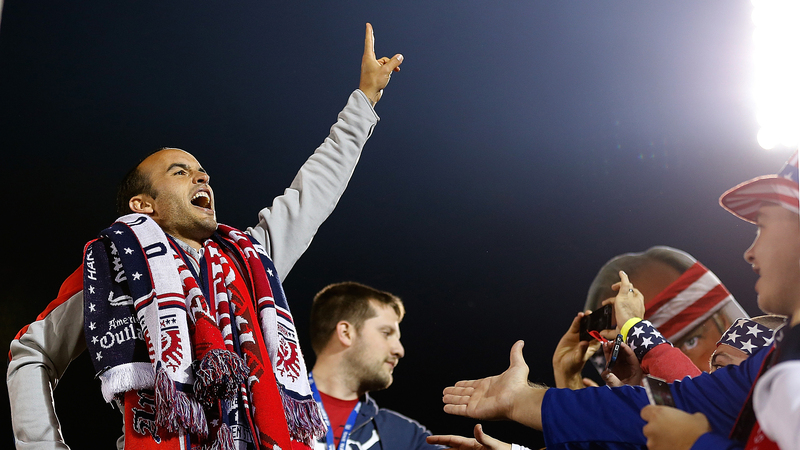 It sometimes seemed that Landon Donovan was looking for a way out of soccer. But in finally leaving, he’s offered us a way in. The strange thing about Donovan’s retirement is not that he’s calling an end to his career; he’s 32, after all, not old for a soccer player but certainly not young for one, and he’s accomplished everything he’s likely to accomplish. He’s won five MLS Cups with two different teams, he’s won four CONCACAF Gold Cups, he’s been a league MVP and a multi-time U.S. Soccer Athlete of the Year. He’s gone to the quarterfinals of a World Cup. He’s the all-time leader in goals and assists for both the U.S. men’s national team and Major League Soccer (both regular season and playoffs). He’s even a two-time player of the month at Everton, proving that, despite the knock that’s followed him since he left Bayer Leverkusen as a homesick kid in 2001, he could in fact get ’er done in Europe. Now his knees hurt; there is no conceivable sense in which he hasn’t earned a rest. No, the strange thing about Donovan’s retirement is that it’s finally a reality, when he’s appeared to be on the verge of retiring for so long. He spent so much time not-quite-explicitly on the threshold of leaving that it started to seem as though he never would. One of the mysteries of his career, in fact, is how he made himself into a figure of ironclad longevity — 157 caps for the national team, the second-most of all time — while often seeming like a gust of wind could take him away from the game. It sometimes seems as though he’s spent longer looking for a way out of soccer than he spent looking for a way into it. He could have left when he came home from Leverkusen, young but already with the air of vague sadness about playing soccer that has perplexed so many of his fans. He could have left when his L.A. Galaxy team remade itself, to his dismay, around David Beckham in 2007. He could have left when his loan to Bayern Munich fizzled in 2008. He could have left, and maybe almost did, when he took his controversial months-long break from the game in 2012-13. He easily could have left when Jürgen Klinsmann left him off the U.S. roster for the 2014 World Cup. He seemed, at most of those moments, like he maybe wanted to go. Instead he stayed through all of them, stared into the distance a lot, and kept scoring goals. You could have a weird impression, watching Donovan’s late career, of someone who got sick so often that he finally became immortal. But it was more than that. Donovan carried a zone of retirement around with him, the way fighters sometimes seem to move in a zone of potential violence. There was always this slight hint of removal, as if he were surrounded by a Photoshop blur set to 1 or 2 percent — hardly detectable, but enough to let you know that you were seeing him, and being seen by him, through a force field of self-created privacy. His life was public (his postgame interview after the Algeria goal included some heartfelt words for his estranged wife, the actress Bianca Kajlich) but also visibly being lived inside his own head (no one could figure out why he brought up Kajlich in the interview in the first place; he filed for divorce a few months later). He was on camera and he was interior. Sometimes the contradiction between those two attributes made it seem as though he might go beyond leaving soccer and just wink out of existence, like the picture on an old-fashioned TV set when you switch it off. Inwardness is a dangerous quality for an athlete, at least for one who wants to be loved. The crowd loves athletes who reflect its own feelings back to it, athletes who can be watched without seeming to watch back, athletes whose characters can be read uncomplicatedly. (Often this is a matter of performance on the part of the athlete, of the athlete’s acting out a set of approved gestures, but that doesn’t alter the point; Roland Barthes writes in Mythologies that professional wrestling appeals to spectators because it offers an image of “the perfect intelligibility of reality.”) Inwardness like Donovan’s makes that kind of identification tricky. It’s not so easy to achieve emotional fusion with your avatar-champion when everything from the tension in his jaw to the way his eyes keep flicking to one side of the frame suggests there’s stuff going on with him he doesn’t want you to see. So he could be hard to love, at least from the crowd’s standpoint. Remember, Donovan came along at a vital moment of transition for American soccer, a chrysalis-level moment. When he won the Golden Ball at the Under-17 World Cup in 1999, soccer was still a fringe sport in this country. You couldn’t take it for granted that the U.S. men’s team would qualify for the World Cup, much less escape the group. MLS existed, but it still thought the way to appeal to suburban moms was by acting as much like a 1997 Plymouth Grand Voyager as possible. Aston Villa games were not only impossible to find on TV on Saturday mornings, the average American sports fan thought Aston Villa was James Bond’s car. Flash-forward to last week, when Donovan made his final appearance for the USMNT, and the change is — but you already know what the change is; that’s why the change was important. The short version: I no longer do a double take when I see an Atlético Madrid shirt in Oklahoma, where the only more exotic piece of sports kit would be a Portland Timbers jersey. Donovan was the face of U.S. soccer for nearly all that time, with all the attendant pressure and scrutiny that implies. I’ve written about this before, but it’s frequently been hard to escape the feeling that a lot of American soccer fans, your Joe Sporting Kansas Cities or whoever, wish he’d been somebody else — somebody grittier or cooler or less self-conscious, somebody more like Tim Howard or Clint Dempsey. So Donovan’s career represents this fascinating paradox. American soccer couldn’t have taken off without him. But American soccer did take off, leaving him an uneasy presence in a spotlight he’d helped create, a complicated hero at a moment that begged for a simple one. He refused to be anything but himself, and what could be more American than that? But what he was — complex, reflective, observant, careful with himself — was so out of step with our expectations for a major sports star that he left us with a sense of something unresolved. He left us wishing, not for someone more authentic, but for someone who’d do us the favor of pretending to possess the kind of authenticity we were looking for. And yet he kept scoring goals. Years passed, and he kept scoring. There were people who called him a traitor when he took that long break from the game — which, keep in mind, came two years after the Algeria goal, something you’d think would have bought him a tiny bit of leeway with web commenters; but it’s true, there were people who felt he owed them something even after that. He took the break anyway, because he thought he needed it, and because he refused to be anything but himself. He meditated and did some therapy, because he thought that would help. And then he came back, and kept scoring goals. Which is why the scene after his last USMNT match — Donovan jumping up and down leading a raucous American Outlaws supporter group in the team’s “I Believe” chant — was so moving. It was partly that the crowd embraced him. He’d been cheered by American crowds throughout his career, of course, but this felt different, more like a culmination; there was a gratitude that took in his whole career and transcended petty sports criticism, and he deserved to hear it. But the scene was also moving because, for once, the blur of aloofness fell away from him. He looked totally and openly in the moment in a way that’s usually reserved for the few seconds after he scores an important goal. It felt, weirdly, as if he was unretiring — as if he’d been gone for a long time and had now finally come back. In a way he had, I guess. The match, an otherwise forgettable 1-1 draw against Ecuador, ought to be remembered only for that. In his “Finish Line” video, after he describes the claustrophobia of the post-Algeria pileup — and he’s joking around here, he’s smiling; still, though, it’s like him that the biggest event of his career had space for this little fretful aside — Donovan trails off. “But it was an incredible moment,” he adds. It was an incredible moment last week. It was an incredible moment for 15 years; now he gets to breathe again.